Leaders, management teams, boards and work groups often need external input from an experienced aging and diversity leader. 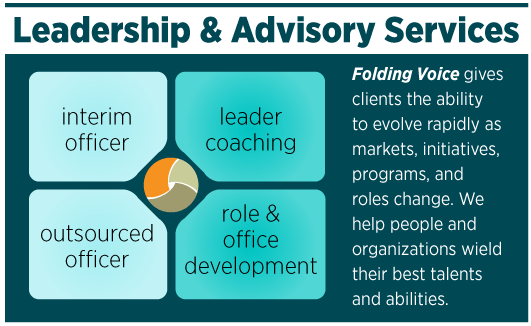 Folding Voice offers you the ability, short- or long-term, to add seasoned leadership to critical product, service, or program teams as an interim officer or project adviser. 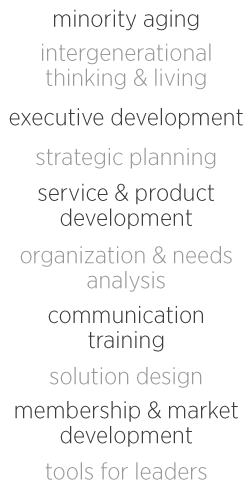 We also work with organizations to develop internal aging, diversity and inclusion, and related positions, offices, and teams.